LTV consists of a traditional two parlor lobster trap equipped with a time-lapse video recording system. We are able to obtain 24-48 continuous hours of video. 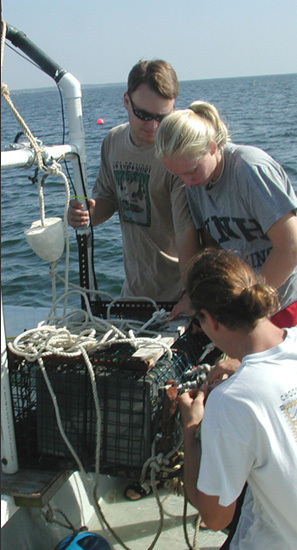 In the summer of 2002 we created a large in situ mesocosm near the UNH Coastal Marine Laboratory (CML), within which we can continuously track the movements of up to 5 lobsters at a time. While acoustic communication is common in many marine species, it has received little attention in the American lobster. In recent work we have demonstrated that American lobsters are capable of both producing and detecting low frequency sounds. This project was developed to obtain long-term records of the temperatures experienced by berried female lobsters (lobsters carrying eggs) and their eggs.